Cathy Freeman said “Being Aboriginal means everything to me. I feel for my people all the time. A lot of my friends have the talent but lack the opportunity”. And although Australia has a lot of catching up to do in regard to the closing the gap scheme for indigenous Australians, being a part of the GO Foundation has truly provided me with the opportunity to live up to my full potential. After deciding that the school I was at previously wouldn’t be an environment to which I could truly achieve my best during my final 2 years at school, my dad and I took our chances and looked into indigenous scholarships for some of Sydney’s most prestigious schools. So, we sent in an application without high hopes and to our surprise we we’re contacted back by the GO Foundation. 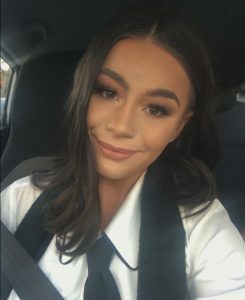 The GO Foundation had provided me with an indigenous scholarship for Pymble Ladies College at the beginning of 2017 when I was then in year 11 and I am currently in year 12 and completing my HSC. The opportunity of going to an astounding school has not only impacted me in an educational sense but also in a cultural and social sense. I’ve noticed that I’ve developed in more aspects than one; I’ve challenged myself, I’ve engaged richly with my culture through GO programs and I’ve surprised myself at how capable I really am when provided with adequate resources in a good learning environment. I have gotten the best grades I have ever received – even being able to rank first in my subjects. This of course is credited to the opportunity; the opportunity that GO has provided not only myself with, but other indigenous students with who are full of potential. Having the expenses of school resources paid for such as textbooks, excursions, a laptop etc has significantly enhanced my learning experience. Being able to access such resources have contributed to my academic achievements in the past two years and has made a massive difference to the way I approach my school work. I’m proud of what I’ve achieved during the time I’ve been at Pymble. I’ve taken up opportunities which Pymble and the GO Foundation have provided me with such as representing Pymble in a diverse range of sport, attending theatre productions and getting a top-notch education. My favourite thing about Pymble are definitely my teachers – they put in such a great amount of effort into their lessons! My second favourite thing about Pymble is probably the kitchen in the senior centre (where all the year 11’s and 12’s hang out) because we can make cups of coffee in our free periods for an energy boost. When I finish school, I want to continue on to university which is very exciting considering I’d be the first one in my family to attend! I plan on doing a business degree and aspire to pursue a career in advertising or marketing. GO has provided me with the support as well as a strong network to be confident enough to go after such a dominant career pathway. Currently only 3% of aboriginal people complete a university degree, but organisations like GO are aiming and helping to increase that statistic which makes me so proud of being a part of something which is so significant! Being a part of not only an organisation but a family has allowed me to meet a community of diverse yet like-minded people. The organisation has also exposed me to some amazing role models – Adam and Michael as well as the people behind the scenes of the GO Foundation such as Shirley and Kate (and everyone else who is involved). I’m so grateful for the difference they are all making and the vision they have for closing the gap. Being a part of the GO Foundation has made me prouder than ever to be aboriginal because I’ve become more aware of the achievements and capabilities of my people. I’ve been able to connect with other GO scholars and have made life-long friendships which I will always cherish. At GO, we also get to go on insightful excursions. On these excursions, GO provides its scholars with career and cultural workshops which help us make informed decisions about our career pathways as well as engage with our culture. Plus, we get to eat yummy food on these excursions which is always a bonus. I’m so excited to see my people shine as bright as they can through opportunities such as the GO Foundation. I’m so grateful for the opportunity of going to a good school and being able to do the best I can. It really proves how important getting an education is and how it assists people in reaching their full potential. I’d personally like to encourage any indigenous students out there to take up the opportunity and make a difference in your own life and your community.